Traditionally, the Republican and Democratic parties have disagreed on how to deal with the American economy. I know, who would have guessed the two would ever disagree? Republicans have traditionally favored the “trickle down” approach whereas Democrats traditionally prefer a system known as “pump priming.” However, in recent years (I couldn’t tell you precisely when), it has not been this easy to distinguish between the two. To briefly explain the two, I will generalize each and give examples of where our nation’s finest (+sarcasm) have critiqued each other’s views on the economy. “Trickle down” is a policy in which funds, usually in the form of tax breaks, are given to large corporations with the thought that large industries with extra cash will hire more people within their organization in order to make more of their product. With more of their product, they can make more sales, make more money, and employ more people. In essence, funds given to large businesses eventually make their way from the top (large business) to the bottom (working class). “Pump priming,” is almost the exact opposite of the last policy. Instead of starting at the top, Democrats have traditionally funded programs that put money into the pockets of the working class. This policy assumes that working class individuals with extra cash will go into the market and make purchases. Through these purchases, money is circulated from the working class up to big business through the products they are selling. Romney has criticized this policy by making several comments about “government handouts,” like the now infamous comment about 47% of Americans that don’t pay income taxes. Now, whether or not he believes this, or will make any actions towards this type of policy, is beside the point. The fact that it was said is important. When it comes down to it, the middle class is very important to America, and is at the same time on the decline. You see, the middle class is the class that gets educated, innovates, and starts reform. They do not get large sums of money left to them and thus have to get an education if they wish to do well financially. With their educations, they invent and improve upon modern technologies. While they are not rich, they do well enough financially to have free time from working in which they can spend on charity and social reform (not to mention the time to study politics and their government). Protecting the middle class is very important to American well being. Unfortunately, I do not see a lot of Republicans grabbing on to this idea. Why? Well, because Obama said it, and frankly, the two parties never agree. I do not believe that economic growth from “the middle, out” is a Democrat or Republican centered policy. It is simply the most logical solution to the enormous problem of middle class decline. America’s Largest Political Party: The I.D.C. Democracies thrive on a well informed, educated electorate. Democracies simply cannot function with a voter base that does not know, and does not care to know about its government. It is an oxymoron. A government for and by the people is impossible when the people don’t care to have a government for and by them. Yet, this is what Americans do, election after election. This seems odd, or maybe its an exaggeration. America’s voter turnout for federal elections hovers at about 48%. 48! Not even one half of the potential electorate. And, what’s worse, is that in years that don’t coincide with presidential elections, it can be as low as 30-35%. Yet, many Americans complain that they do not have a voice in government; that government is out for itself, and nobody else. What else could we possibly expect? By default, if the group of individuals that do not vote were to band together into a political party, they would outnumber both the Republican party and the Democratic party, combined. And yet, they are a political party, the I.D.C. What is their political stance? To let the American government run itself, with no checks or restriction. Essentially, 52% of the country votes, by not voting, to allow just this to occur. So, by the rules of majority, the government has become what it is today because it is what its people have requested. 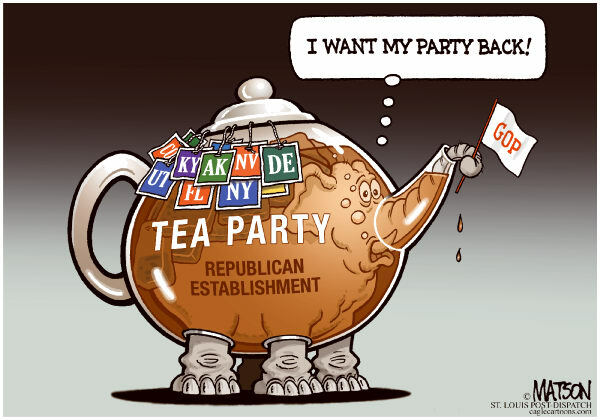 I have begun to realize that it could easily come across that I simply do not like the Tea Party. Why am I bothering to write something about this? The answer would be that I do not want this to be the case. I am a firm advocate for third parties. I want individuals to find the political party that is the best fit for themselves. I want to clarify my claims, my opinions, on the Tea Party in the United States. When I first heard of the Tea Party, I was quite interested in it. I liked what they said, and I liked what they stood for. I liked that they encouraged all Americans to read the constitution, to understand their government, just as I would recommend this to any of you. I liked their rhetoric about making America a “great nation” once again. I don’t know why it changed either. I don’t know if I changed, if the party changed, or perhaps a mixture of the two. Instead of encouraging people to read the constitution, they began presenting small sections of the constitution to its followers, with no context. This bothers me. Anything, whether the constitution, the Bible, or even the Qur’an can be made out to mean terrible things, far from their original intent, when not presented in context. Whether the Tea Party was taking or using the constitution out of context, is something I don’t care to discuss. It is not my main problem. It merely made me skeptical. Then, they began making claims, like the often repeated John McCain quote, that this country was founded, a Christian nation. You can argue me on this, and I would expect some to, but the founding fathers were explicitly clear on their stance of religion in government. Whether you believe that our founding fathers were Christian, which is only half true (some were merely theists), or that the nation was founded on Christian morals, which is again only half true (the morals regarding stealing, adultery, murder, etc. can be found in any major world religion), the founding fathers knew it wise to separate church and state for the protection of them both. To protect the church from government influence/intervention and to protect government from church. This is not to say that religion is corrupt, but that many men have used religion in a corrupt way to gain power. So to clarify, I do not hate the Tea Party. I do not think that people that like the Tea Party should stop. I do however wish that they would found their claims and rhetoric to a firm foundation and hold true to being the constitutional party they started as. Sure, it is filled with sarcasm, but you cannot deny that it goes quite a ways into backing up its claims. In the past week, Americans have watched as several protests have occurred in the Middle East. While thousands have engaged in peaceful protest, many have turned to violence. Many have been injured from Americans, to policemen, to the protesters themselves. Four Americans died at the U.S. Embassy in Lybia. All of this violence, all of this destruction, and all of this time spent in regards to what? The actions of one film-maker from California. Now, from a previous post, you know that I can agree that this particular film was, in fact, quite offensive. But, when it comes down to it, the individuals engaged in these protests, both peaceful and violent, have taken the actions of just one individual and applied them to us all as Americans. Chanting, marching, and riots in the name of American hate. American flags can be seen burning across the Middle East. All of these protests occur in the shadows of the Arab Spring, a time where many of the nations engaged deepest in these protests desperately called out for American help and willingly accepted it upon arrival. I am sure that we all know that this country does not always keep the well-being of other countries at the forefront of its intentions. As a matter of fact, I would assume that we always care about ourselves first. But for entire nations to call on our help, our money, and we arrive with the intentions to help, only to be thrown away because of something one person said, in a nation of millions. Actions like this make you think about just how much time we WASTE trying to help other nations that seem as though they will NEVER be thankful. There is no way in which these actions can be presented as permissible, but there are several things that we can learn. Countries in the Middle East do not understand, and probably will not ever understand how our government operates. Separation of church and state is a completely foreign concept to them. A government that protects our rights to freedom of speech is foreign to them. Protestors are angry at our American government for allowing such a video to be produced. This goes to show that they do not understand. However, while not illegal, the video was incredibly offensive and disrespectful. Americans need to learn that simply because you have the freedom to say something, does not mean that you should. This is why our nation is not, and should not ever be, a “Christian Nation.” Relations on the international level require calm, rational, and level headed thinking. Religion is opposite of these things. It is, and should be, passionate. These countries in the Middle East have blended their Religion with their country, and have taken threats to their religion as threats to their homelands. Because their religion has been called out, they have called on their countries to react. This is extremely dangerous, and even irresponsible. This is my thought, and nothing more than that. When I hear individuals say that we are or should be a Christian nation, I take a moment to look at those who have done just this, and I must admit, I don’t like what I see.